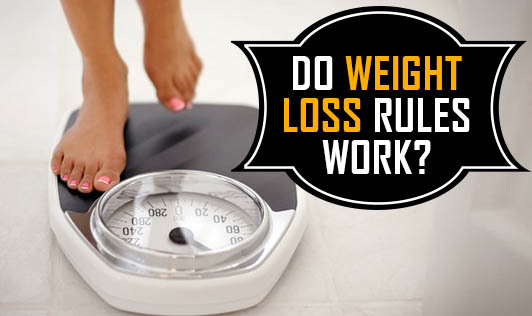 Do weight loss rules work? Don't eat after 7 pm. Exercise more when you 'cheat'. Ban carbs because they are bad. Binge on 'negative calorie foods'. Flush out toxins from your body. Your body metabolism doesn't stop working after 7 pm. However, there's much less physical activity in the evening and night as compared to the morning. So, it helps to reduce food quantity at night and to avoid elaborate dinners and heavy snacking after 7 pm. It's not practical for everyone to eat every 3 hours. Also many people are comfortable eating only 3 meals in a day and drinking lots of water in between. Do what you are comfortable with. Exercise is not a punishment for eating something that's not on your list. It has much more benefits than just weight loss. Ask your dietitian how to balance calorie intake and output for better weight loss. Carbohydrates are the main source of energy for the body. Banning carbs will only make your diet skewed and will not provide complete nourishment. There's no such thing as 'negative calorie foods'. All foods give calories in varying proportions. Needless to say, the other nutrients are equally important. Your body has a natural mechanism to flush out toxins on a daily basis. The liver, kidneys, bowels and lungs remove the unwanted material from within you regularly. These processes don't reduce weight but clean up your .